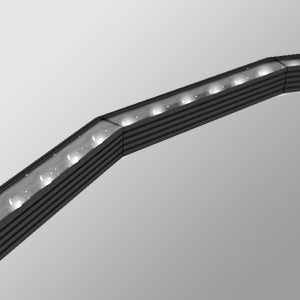 Compact yet very effective, HORIZON FLEX is a curvable linear LED system made of high-grade extruded aluminum. It is available with optics and lenses that provide incomparable control of light intensity and quantity. HORIZON FLEX is totally customizable and a perfect response to the specific needs of commercial, institutional, and private spaces. The increments allow you to curve on-site the HORIZON FLEX, for no visible light interruption. It can be used to reinterpret its environment with surface grazing with a long throw (up to 20 feet), edge lighting, or suspended fixtures. Available in 3W/ft, 5W/ft, 7.5W/ft, 8W/ft, 10W/ft, 12W/ft. 12V: increments of 4” (102 mm). 24V: increments of 4” and 8” (102 mm and 203 mm). High power linear LEDs or mid power linear LEDs. 7°, 11°, 28°, 42°, 8°x52°. * Available for tailor-made application. Please contact your Eklipse representative for further information. No filter / Clear filter.